An average of 4.4 million Californians received welfare food benefits each month in fiscal year 2015, according to the Public Policy Institute of California. ​Overall, Californians received nearly $7.53 billion, or 10.8% of the total national spending on SNAP benefits. California has a small state-funded program ($80 million in fiscal year 2015) to assist non-citizen legal permanent residents who are ineligible for federal benefits. 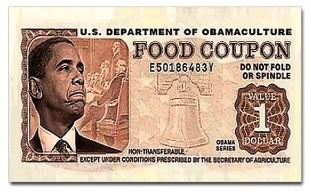 While Barack Obama was the first president of the United States to spend more on welfare benefits than on national defense, (according to data published by his own Office of Management and Budget), under President Donald Trump, food stamp usage is down significantly. Participation in the Supplemental Nutrition Assistance Program (SNAP) dropped to 41,310,785 in June 2017, the latest data available from the USDA, from 42,691,363 in January 2017. Yes, that is more than 41 million recipients on the welfare food program – and CA has a disproportionate number of them.